What are the study abroad enrollment trends of Indian students? 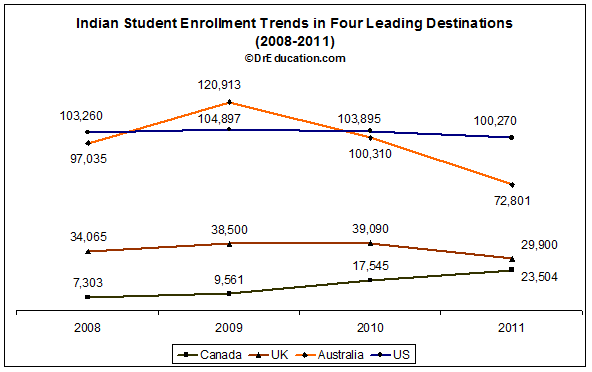 Four year enrollment trends of leading destinations indicate a stagnancy or decline, except with Canada. What explains this trend? What are the future enrollment trends expected for 2013? Note: above data includes all levels of enrollment. For example, VET level enrollment in Australia and OPT in the US. The post-recession scenario hit the mobility of Indian students quite hard and uncovered two primary segment of students–immigration-driven and career-driven. Each destination has a mix of these two segments. It ranged from majority career-driven Indian students going to the US at master’s degree level, to majority of immigration-driven students going to Australia and enrolling at vocational and technical colleges. Due to recession, the US as a destination lost some of its attractiveness due to a lesser availability of financial assistance from universities and poorer prospects of finding jobs after completion of education. This is the time when one-year master’s programs in the UK became quite attractive for Indian students who were ready to pay for shorter duration master’s programs and a higher potential for immigration as compared to the US. At the same time, Australia hit its peak with Indian students in 2009, with a large wave of Indian students using education as a pathway for immigration through vocational program. This large wave of Indian students with immigration intentions also unearthed several cases of visa abuses and prompting both Australian and British government to tighten regulations. As a result, the enrollment of Indian students in the UK and Australia plummeted, however, Canada became a beneficiary because of its immigration friendly policies and attracted larger number of Indian students with immigration-intentions. In 2013, I expect to see slight recovery for the US due to demand side factor of larger pool of students willing and able to pay for their education and at the same time increasing optimism about the US economy will increase the application pipeline for fall’2013 enrollment. The UK is facing high negative perception among Indian students and is unlikely to start recovering until next year. At the same time, Canada may face some challenges similar to what Australia faced a couple of years back. In 2013, I expect Australia to start recovering from its bottom primarily due to negative perceptions in the UK and reversal of some immigration policies including new post study work visa arrangements. Any other thoughts/explanations? What could be near term trends of mobility of Indian students? UK, as you have rightly said, have put up stringent visa rules. Though there has been a lot of hue and cry about it, it will take at least a year or two for the UK to pick up among Indian mobile students. Australia, though much improved now, still bears the scars of the racial attacks on Indians. Another trend I guess that will pick up, as more and more Asian universities come into the global ranking and emerging economies in Asia grow, is the India students going to Asian (South East and Middle East) universities. That of course will again take two to three years. 1) The number of undergraduate students to the US has been declining in the last few years, this market would be recession proof I thought. But apparently not so in India atleast ? The numbers were 15210, 14026, 13035, in 2010, 2011 and 2012 respectively. The number of Chinese undergrads are completely in contrast, the numbers for 2010, 2011 and 2012 are 39948, 57036, 74507 respectively. 2) Also, do you know the breakdown of the students going to Canada ? What proportion are graduate students and what proportion are undergraduates ? I know that a lot of Indians in the Gulf countries send their children to college in North America, and it might be possible that they are sending them to Canadian schools instead of American ones due to the easier immigration requirements. It also seems that Indian students are not going to the top Canadian schools ? Here are the numbers for undergraduate student numbers at the University of Toronto from China and India, from 2005 – 2011, spectacular growth among the Chinese and stagnation among the Indians. The numbers for the University of British Columbia are very similar. I am Agrodut Mandal. I was searching for UK university list and found your site. I am intending to study abroad and my first choice is UK. But, my knowledge about the universities there are very few.I want to know about the best 5 universities in the capital of UK. I will join there within the next 2 months. And, I want to know if there is any scholarship offered by universities. Please help me anyone. Thanks in advance. Now a days students are looking for such study course which can allow them to earn while studying. For example executive MBA and many institutes are offering these courses in India and abroad. Here in India also many MBA institutes in Bangalore offering executive MBA course. Students can get benefits of these courses from these management colleges in Bangalore and other cities.